Brand ambassadors and brand advocates can play a key role in your organization’s marketing strategy. Where do you find these folks to embody your brand and shout its greatness from the rooftops? Look no further than your team. 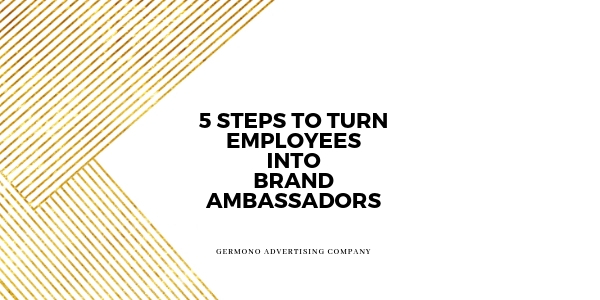 Employees can serve as the first line of offense in your brand ambassador army. How you turn employees into advocates? I’m glad you asked. These five tips will get you started. Develop an employee newsletter. This does not have to be super fancy and can be distributed via email. Remember to think about your employees, how they receive information and the best distribution method. Hang posters or flyers with this information in highly trafficked areas. Send a video update from the CEO each quarter. Do you have an intranet or company Facebook group? Develop a mechanism for employees to engage with each other, ask questions and receive information. Lead. We hear lead by example over and over again, but it is so true. Exhibit the behavior you expect from your team. I was once walking with the CEO of my organization through a parking lot and he picked up a soggy hot dog bun with his bare hand (gross!). He didn’t call someone else to bring a broom or clean it up. This not only showed me that he cared about our facility but also that he wasn’t above picking up trash to ensure our company was pristine for our clients. He modeled the way every day through his actions, empathy and professionalism. Can you say the same? Encourage. Employees value a workplace where they feel appreciated and that they are an essential part of the team. Do you encourage your team? A thank you note or “good job” can go a long way. Do you have a recognition program in place? If an employee knows why their workplace exists and feels valued, do you think they’ll tell others? I do. Listen. Sometimes our best ideas come from the bottom up. Are you actively listening to what your team says? Are you then taking this knowledge and using it to make your organization better? Are you conducting an employee survey? Have you created an environment where your team feels comfortable to bring ideas and suggestions to you? A fun way I found to encourage new ideas is a team idea board. Take a dry erase board and encourage all team members to share suggestions. If their suggestion is implemented, reward them with a gift card and recognize them in front of their peers. Super simple and you never know what new initiative you may find. Equip/Empower. If a member of your team had to give your organization’s elevator pitch today could they do it? Can they recite your values and mission statement? If not, why not? Have you equipped them with this information? If you had an unsatisfied customer, could any team member make their experience better? Take all of the information you are communicating in step one and make it readily available to your team. Equip them with the knowledge and tools they need and then empower them to provide a great experience. Are you ready to create an internal brand ambassador plan for your organization? Email me at Jennifer@Germono.com. I’d love to help.